I read that Researchers from Edinburgh University have identified 419 accounts among the 2,752 ones recently suspended by Twitter in the United States that, on behalf of the Russian Internet Research Agency (IRA), operated to influence British politics. 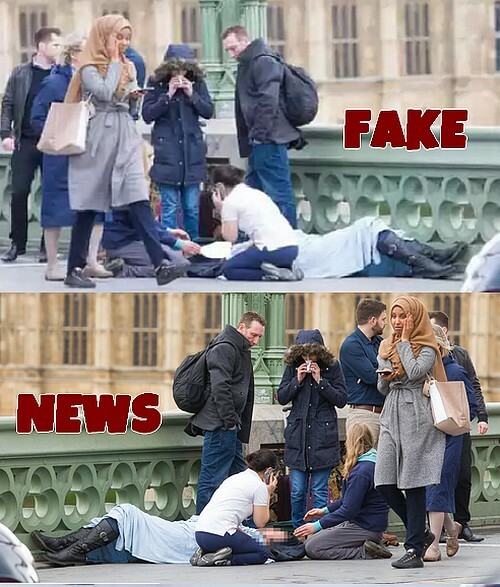 One of them aimed at provoking anti-Islamic sentiments in the hours after the Westminster Bridge terror attack in March, publishing among others a photo depicting a Muslim woman walking beside the victims, ignoring them with obvious indifference. This image was then shared on many English newspapers, including Mail Online and Sun, as well as thousands social networks pages and lots of international websites ever looking for such pseudo scoop. This is my job, this is the mission, this is the profit. I'm here for you, ladies and gentlemen, that is, loyal users. My duty is to give noises and paint of blood the horizon, to show the worst that can make you feel better. So, play your role, don’t ask any questions. Expand your eyes, explode them, make yourself one thing with them. Don’t have any doubt, because then you will sleep as always. Now, let's close the light in the room, the movie begins. The scene is on the screen, remaining still, immobile as a life that doesn’t want anything more than ignorance. Blessed are the latter, they say, but even more who sells it, you know? Few seconds, just a handful and the final song is already on air. Small was the time, just as the thought will be. One word, at most two, injected into what remains of the heart. Or was the liver? Oops, my mistake.. Anyway, I never said I had a medicine degree, right? Besides, I didn’t say anything. With empty skulls and the bellies already full from the very beginning, the sedate audience will abandon the hall. An emotion, at most two, to infect what remains of the body. Well, I've never said I could discern it, is not that right? To be honest, I don’t care about the differences at all. I am just the one who put them, where they are not. By name and substance, what lies are made of. Yet you have faith in me. You blindly believe me on the word. For me you go to war and fight. You live and die in my name. Like a god you invented.